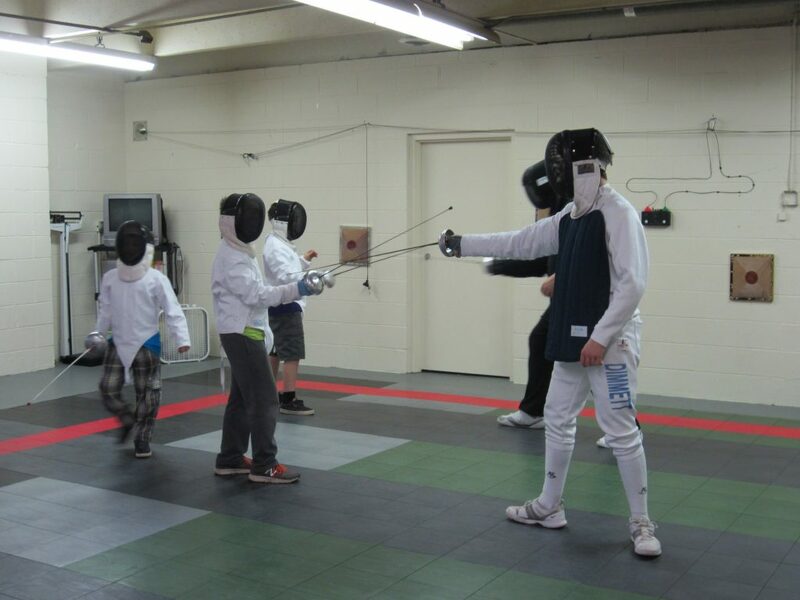 Our modern fencing program is the core fencing activity at Salle Green. Modern fencing is modern. It descends from the core concepts developed by the Medieval Masters and refined by their Renaissance and Enlightenment counterparts and took its modern shape in the classical period of the late 1800s to the start of World War II. However, like all modern sports it has been transformed by advances in understanding the functioning of the athlete’s body, the development of modern methods of training, and the explosive growth in youth participation. The sport of 2016 is very different from the sport of even 30 or 40 years ago. The evolution of technology, the demands of retaining its place as an Olympic sport, the constant development of rules reflecting trends in the sport, and the expansion of fencing to being truly a sport of six contients and 150 countries, all mean that today’s fencer is part of a vibrant and challenging environment. At Salle Green we teach modern fencing for both recreational fencers and serious competitors. Our philosophy is that the sport cannot grow without both groups. Our recreational fencers develop as both club competitors in our weekly pools and in our 7 annual Salle competitions and as training partners for our competitive athletes. Our competitive athletes not only represent the Salle in competition, but also bring back knowledge and experience that help keep our recreational fencers engaged in the modern sport. Open badge for the Level 5 Gold award in Sabre. We use the Pan American Fencing Academy Skill Development Program to provide a roadmap for learning the knowledge and skills needed to be a successful fencer. 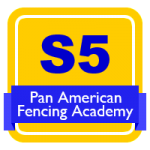 This five level program includes written knowledge and practical skills testing designed to ensure a fencer is competent in a full range of technique in either the foil, sabre, or epee during his or her first years in the sport. This provides a solid basis on which the fencer can build an individual style with techniques and tactics that are most successful for the individual. Each level completed is marked by award of a certificate, sleeve patch for the uniform, and an electronic open badge as a portable credential for social media, resumes, etc. 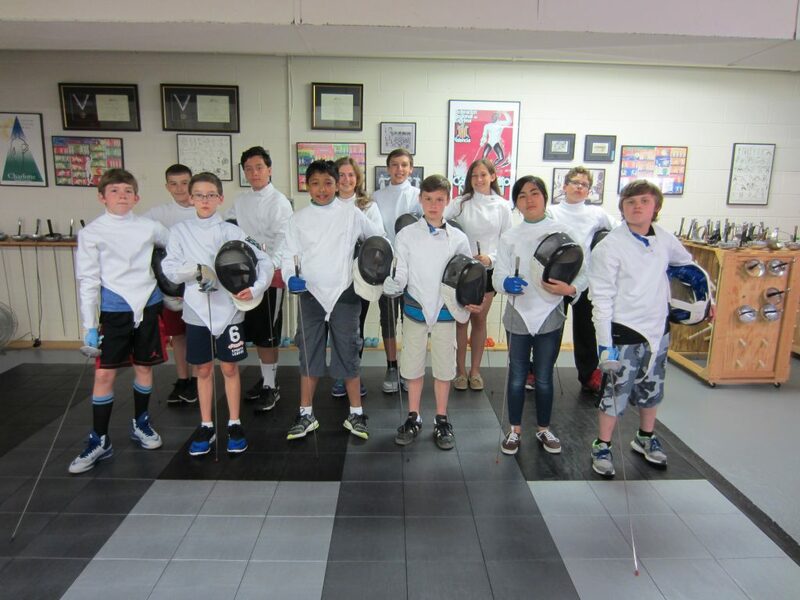 The modern fencing program incorporates youth fencers from our Musketeer Epee program, teenage fencers, adults, veteran fencers (over age 40), and fencers in rehabilitation after injury or with disabilities. We believe that having as many of our members as possible working together demonstrates to all the importance of fencing as a life time sport, provides role models for younger fencers, provides faster opponents for our adults and veterans, and allows us to incorporate fencing in the chair or with visual limitations to expand our senses and our skill sets. All members are expected to be willing to fence any other member in their weapon and to respect what each opponent brings to the fencing floor. (1) Primary Course: introduces you to fencing in four one hour sessions covering fundamental skills. In the first session you choose the foil, epee, or sabre, and will work with that weapon throughout the course. The Primary Course is designed to help you decide whether fencing is a sport you want to pursue, and if so, to move you quickly into our Intermediate modern fencing program. We do offer a 60-90 minute Quick Start program for those returning to fencing after a prolonged break or for those who absolutely have to start fencing today – contact us for details. (2) Musketeer Epee: provides beginning level technique development, movement skills, training in the self-discipline needed to be a fencer, and practice fencing bouts for fencers age 6 to 10. Young fencers who wish to compete often join our regular Intermediate Program after an introduction to fencing in Musketeer Epee. (3) Intermediate Fencing: two group classes in each weapon each week provide an important part of a fencer’s development through structured instruction and drills to develop technical and tactical skills. Although titled Intermediate, the focus is on development of a full range of skills from fundamental to the most current advanced competitive. Most of our fencers participate in the Intermediate fencing program. (4) Advanced Fencing: includes the full range of group classes, 3 and 5 Minute Lessons, longer individual lessons, solo training, and support services. The specific individualized content of training is determined by the experience, technical and tactical sophistication of the fencer, and short and long term goals as applied in a periodized training and competition program. (5) Team Training: each week gives our competitors (and any member interested) a chance to work through specific needs in training ranging from rules applications discussions to strength training, interval training, games tailored to specific fencing skills, etc. This broadens what we can offer in the normal format of classes and is responsive to lessons learned in competition. (6) Fencing for Athletes with Disabilities: not only lets us brings our sport to wheelchair and blind athletes, but also expands the training and injury rehabilitation options available for all Salle members. Our primary goal is to develop competitive opportunities for athletes with disabilities in the Richmond metropolitan area. However, anyone who has ever fenced a wheelchair fencer or has fenced with his or her vision obscured understands that these are opponents with skills and abilities that directly benefit able-bodied athletes as well. Athletes with disabilities are potentially full partners in all of our fencers’ training.